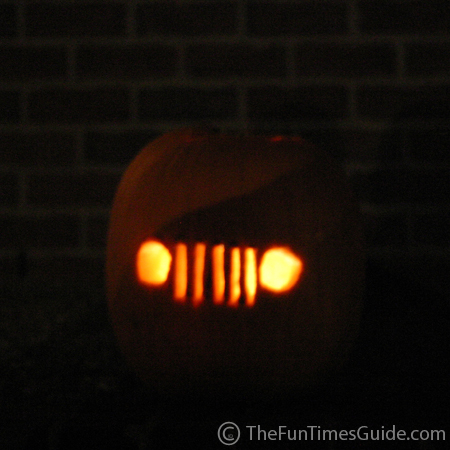 Last year, we thought it would be fun to carve some Jeep pumpkins for a change. 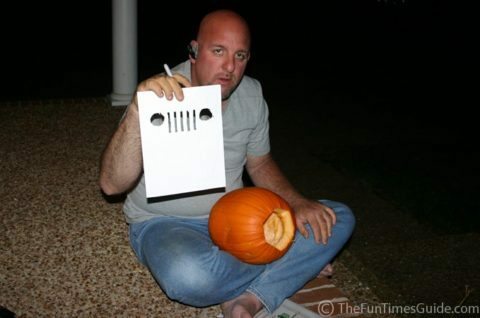 But we couldn’t find any Jeep pumpkin templates anywhere. So we created our own. We’re sharing them below – for you to use too! 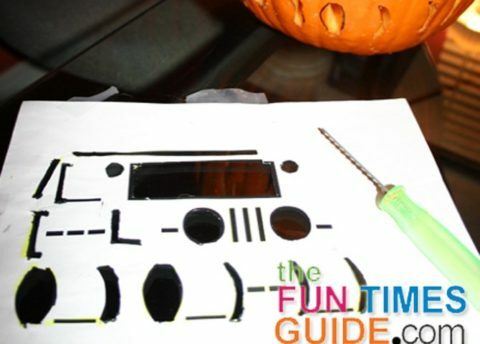 Let The Jeep Pumpkin Carving Begin! We were excited to try out the new Jeep templates we created. Even though we are always the last ones carving pumpkins on the porch each year (usually still carving up to the very minute that the trick-or-treaters start arriving), we usually manage to create some pretty cool looking pumpkins in the end. This time, however, was another story. 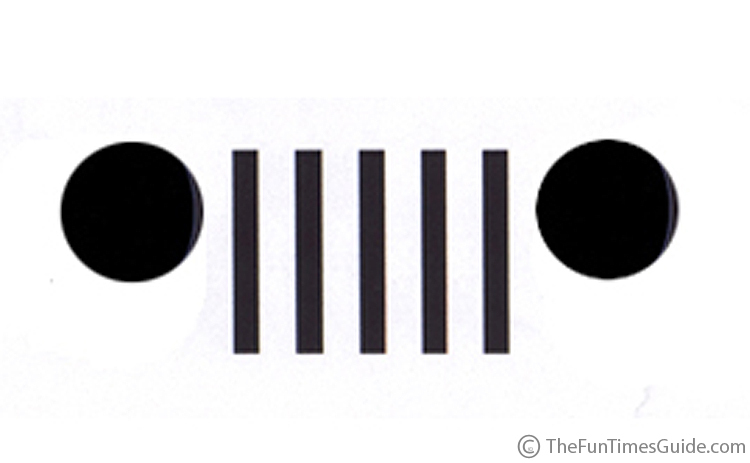 To me, the Jeep grille template is just too simple. To the public: it’s… it’s… railroad tracks? Just kidding. People (especially the Jeep fans in the neighborhood) knew what it was. But we certainly didn’t do it justice with our less-than-perfect straight lines — which ultimately make a grille a grille. I, on the other hand, had it in my head that the Jeep Wrangler template would surely yield the world’s best Jeep pumpkin. …And people would be talking about it for years to come. You need more than 10 minutes to undertake such a project — especially for the first go-around with some new templates. The pattern itself could be a tad bigger for better overall perspective (i.e. to look “sharp” and clear from a distance). TIP: Just enlarge it before printing. The cut out spaces should be thicker to add more dimension and allow more light through. If you allow say… 30 minutes instead of 10 (before the trick-or-treaters started arriving, and we ran out of time) then you might have time to actually carve out the grille part, and some of the other minor details which we completely ignored. Overall, if we’d taken our time, made the cuts cleaner, and sharpened up the edges, then our Jeep pumpkins surely would’ve won the “best pumpkins on the block” contest again this year. 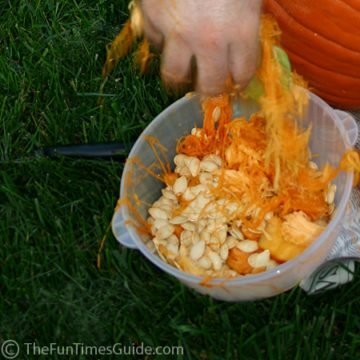 Jim made some friends — and a few enemies — when he offered all the kiddos a handful of GOO (slimy pumpkin seeds & string) in lieu of sweet treats from the candy dish. 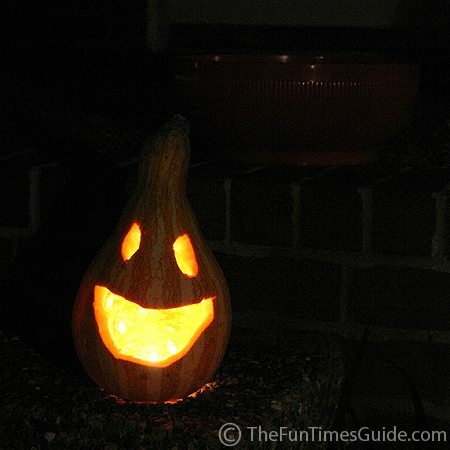 In the end, the simplest of them all may have been the best-looking pumpkin we created on this night: a simple smiley face on a squash gourd — no template required!